Sonifi from Sonik Architects puts you in the DJ’s seat with some simple tools that allow you to remix techno music like a pro. Everything is done through the accelerometer and touch controls of the iPhone and second-generation iPod touch so that anyone can create their own mix—whether they have musical talent or not. Put the ‘Tech’ in ‘Techno’: Take different tracks from Sonifi’s four channels to create a hopping techno mix. Sonifi has four channels (Lead, Synth/FX, Bass line and Beats) each containing four different tracks that you can mix. When you tap a track, Sonifi will automatically start playing it at the next beat count so you don’t need to have impeccable timing like a professional DJ. You can also mute each channel by simply sliding your finger across it. Sonifi lets you easily add stutter effects to your mix by shaking the device in one of six directions—left, right, forward, backward, up, or down. This will add an effect at the next 1/8-note to make for a sweet transition into the next phase of your remix. 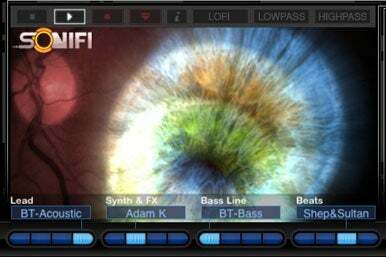 There are also lofi, lowpass, and highpass filters you can use to great effect by dragging your finger around the screen which has stunning visualizations that react to the music as well as touch. All remixing is done in real time as the music plays, and you can record your mix to share with friends later. iPhone OS 3.0 users can even connect through Bluetooth to edit and remix together. Sonifi was a lot of fun to use and defiantly has a bright future. Sonifi is compatible with any iPhone or second-generation iPod touch running the iPhone 3.0 update.